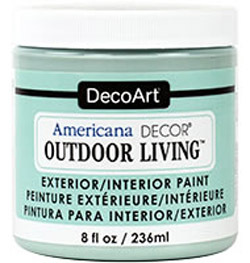 DecoArt is a U.S. manufacturer of the highest quality acrylic paints and craft supplies on the market. 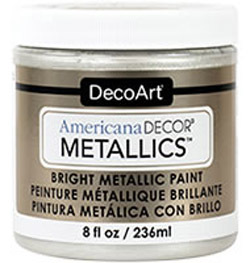 Their product lines include Americana®, Americana Decor® Chalky Finish, and DecoArt Media®. They bottle, box, and ship their products from their US facility to distributors and consumers around the world. 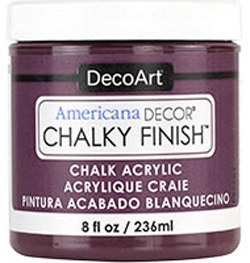 This paint produces a chalky matte finish that can be used to create vintage decor pieces. It can be used to up-cycle any piece, including laminate. No need to prime or sand work surface due to the chalky adhesion technology of the paint. It provides excellent opaque coverage, and can be mixed with wax to create transparent wash effects. The paint can be easily distressed to create a vintage look. It can be buffed to a smooth, shiny finish on it’s own or by using a creme wax. Can be used on wood, ceramics, most plastics, canvas, terracotta, fabric, metal and glass. It is water-based and non-toxic for quick and easy cleanup. Available in 43 colours in 8 oz jars. 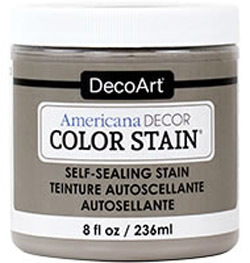 Americana Decor Color Stain® offers a unique self-sealing technology that gives a durable, weather-resistant finish to interior and exterior home decor projects. Its beautiful semi-transparent finish does not require an additional sealer. This is the ideal stain for refurbishing patio furniture, deck boards, terra cotta pots, outdoor signs, and more. Available in 21 colours in 8 oz jars. 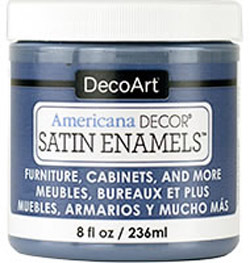 Americana Decor® Satin Enamels™ is a specially designed acrylic that gives a durable, satin finish to home decor projects. Works especially well in high-use areas such as bathrooms and kitchens. Its smooth brushability ensures fewer brushstrokes and minimal grain raising on wood. No need to sand or prime before using. Americana Decor Maxx Gloss provides a revolutionary, superior, high-gloss sheen that delivers an almost lacquer-like finish. It enables you to create contemporary, sleek, and polished furniture and home décor accessories. Until now, this level of gloss finish has only been available in aerosol spray paints. Aersols cause over-spray and must be used in a well-ventilated area for safety. 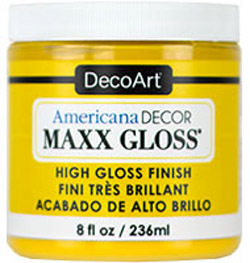 Maxx Gloss now offers DIYers the ability to add a high-gloss finish with a water-based, non-toxic, brush-on formula. Patent protection has been applied for. Can be used on wood, terra cotta, canvas, metal, decorative glass, most plastics, and more. The advanced adhesion technology assures a durable finish on almost all surfaces without the need to prime or sand.